Heavy rains continued through much of last week, but we finally had some beautiful sunny weather over the weekend. 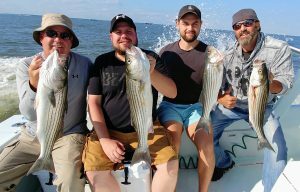 Many anglers got out on the bay to enjoy action with striped bass, bluefish and southern visitors such as speckled trout and red drum. This begins a special time of year. No, it isn’t pumpkin spice season. It is Rocktober – a time of cooling waters, shorter days and acres of breaking fish and screaming gulls. This week, anglers will be treated to stable weather with moderate temperatures, low winds and a very low chance of rain. Expect improving water conditions for gamefish, including the mighty rockfish. With uniformly mixed waters, there will be plenty of cool, well oxygenated water from the surface down into deeper waters of at least 30 feet for hungry fish to roam. However, the Don’t Fish Below Depth at Swan Point and the Bay Bridge is 16 and 25 feet, respectively. At the Maryland Department of Natural Resources and National Oceanic and Atmospheric Administration buoys, water temperatures are cool, with the Susquehanna River at 65 degrees, Gooses Reef at 73 degrees, Point Lookout at 73 degrees. Temperatures should remain stable as the week of moderate temperatures continue. Expect poor water clarity from the high flows coming from most rivers and streams. The Susquehanna River’s muddy water will likely extend down to near Gooses Reef. In addition, there is poor water clarity on the Potomac River down below Breton Bay with the worst water clarity from Mattawoman Creek upriver from the high flows. There will be above average tidal currents Friday through Tuesday as a result of the new moon Oct. 9. For the full weekly fishing conditions summary and more, pleasure be sure to check out Click Before You Cast. There is still some debris in the upper bay due to the Conowingo Dam operating with as many as eight spill gates open last week, however the size and the quantity of the debris has decreased. Water continues to be stained from runoff and the flow is higher than average, but the situation should steadily improve with dryer, sunny weather. According to local tackle shops, chumming and fishing with cut menhaden chunks continues to produce striped bass in the usual locations, along the 20-foot to 25-foot channel edges at Swan, Love and Podickory points. Live-lining with spot and jigging has been good around the Bay Bridge pilings and rock islands. Numbers of bluefish seems to be down this year due to high freshwater flows and low salinity. For those seeking live baits, spot will be harder to find as water temperatures slowly go down in early October. They can still be found in the lower Magothy River and the shallower side of the Bay Bridge in about 15 feet of water, including the area around Sandy Point and Dolly’s Lump/Hackett’s Bar. We have also received reports that striped bass are starting to move up into the various rivers, such as the Patapsco, and are being caught from shore on bloodworms and peeler crabs and also from boats while jigging. Top water baits, or poppers, are working near piers and structures in the rivers, especially during low light periods like mornings, evenings and overcast days. Trolling the mouth of rivers is also producing with light bucktails and small paddletail swimbaits. Fishing for large white perch continues to be good in the tidal rivers and along shoreline structure for those casting small spinners, spinnerbaits such as Perch Pounders and Super Rooster Tails, and small jigs with plastic Twister Tails. Some anglers like to tip their jigs and spinners with small pieces of blood work to provide a scent trail. 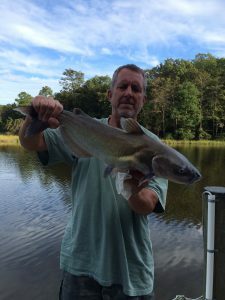 Channel catfish have been active and aggressive from the Susquehanna Flats down to Matapeake and can be caught in all of the region’s tidal rivers. Some larger channel catfish are being reported from the Podickory Point area on cut bait. Cooler water temperatures continue to shift the striped bass fishery toward a fall pattern as we enter Rocktober. Breaking striped bass, with some small bluefish mixed in, are becoming a more common sighting as schools of baitfish move out of the tidal rivers and into the bay. Some anglers are still live lining with spot or peanut bunker, but folks are starting to switch over to casting, jigging and trolling umbrella rigs with 5-6 inch plastic shads. 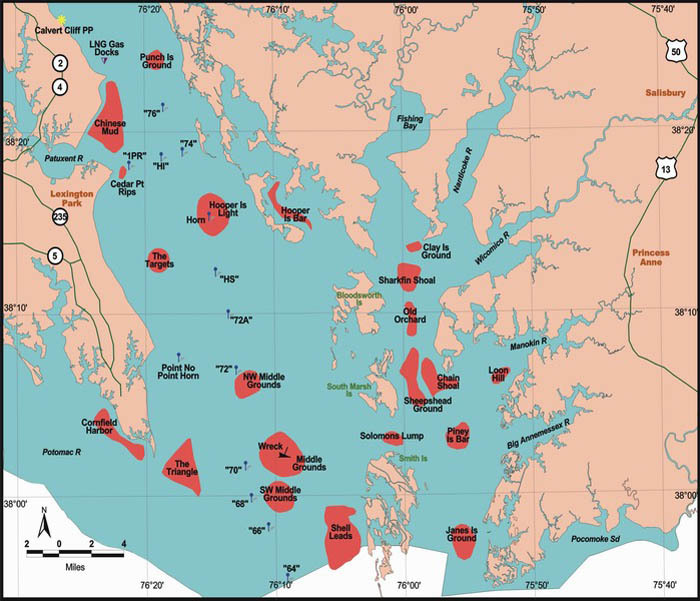 The current hotspots are around Buoy 83, Poplar Island, Eastern Bay, Gum Thickets, Thomas Point, Tolley Point and the Bay Bridge rock islands. Bottom fishing for white perch and spot in sheltered “lee” areas is a good backup plan on windy days. Fishing over oyster bottom in deeper areas or around docks and piers with peeler crab, bloodworms or grass shrimp continues to be a good bet. If you are interested in spot, they tend to prefer bloodworms or fishbites. Casting small spinnerbaits, jigs or spinners around shoreline structure with ultralight tackle is still producing white perch in shallow water. Expect these perch to start moving into deeper water after the first couple of major cold fronts. The recent Rod and Reef Slam Tournament provided some interesting action and showed species diversity on the mid-bay oyster reefs and artificial reef sites. A total 28 participants in powerboat and youth divisions logged in 79 catches, with 12 species caught – Atlantic croaker, blue crab, bullhead catfish, silverside, spotted sea trout, spot, striped bass, summer flounder, oyster toadfish, weakfish, silver perch and white perch. Overall tournament winner Lenny Rudow caught 7 species. The youth winner caught 5 species and most catches were logged in Harris Creek and on the Clint Waters Reefball site at Cook’s Point. Tackle shops and charter boat captains continue to report that trolling a mix of hoses and small spoons is a good option to catch a mix of striped bass, bluefish, Spanish mackerel, red drum and cobia. Also, please note that cobia season officially closed Sept. 30 and any cobia caught must now be released. Planers are being used to pull lures down to the correct depths along channel edges and the outside edges of breaking fish. 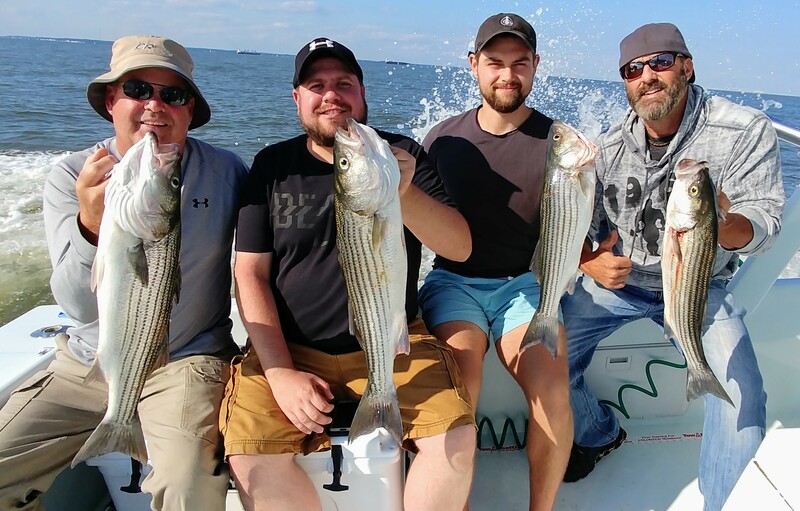 The Tangier and Pocomoke sounds and the zone between Point Lookout and the Cedar Point rips have been producing Spanish mackerel, bluefish up to 5 pounds and mainly small striped bass under 19 inches, with a few bigger stripers mixed in. 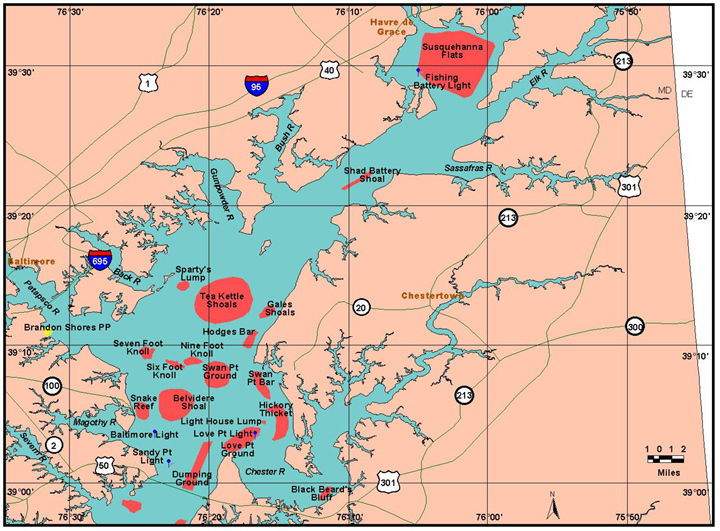 Chumming and cut bait has been a good way to target a mix of striped bass and bluefish in the lower Potomac River near St. Georges Island and Pt. Lookout. 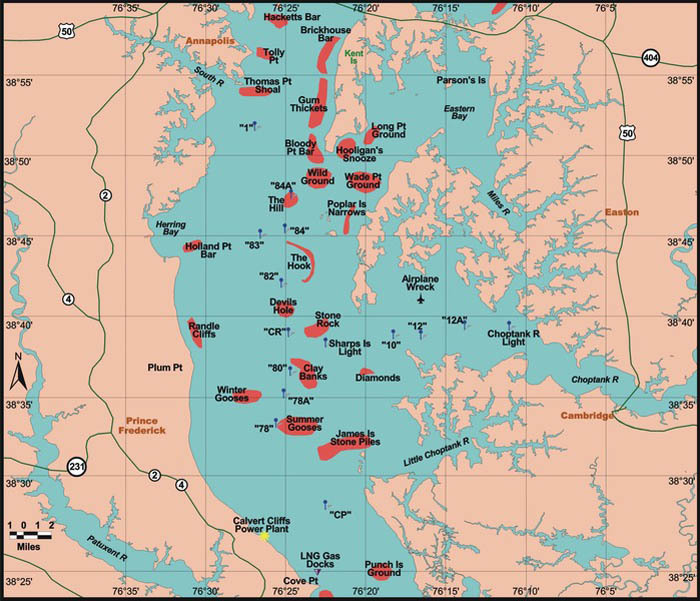 Charter boats are also finding striped bass upriver, well north of Tall Timbers, all the way up to Cobb Island. With the cooling trends, the tidal rivers of the lower Potomac and the lower Patuxent River continue to produce striped bass along shoreline structure for those casting topwater lures, swimbaits and crankbaits. 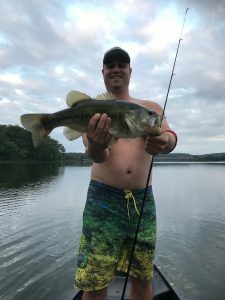 Cooler water temperatures have fish very active in these shallower waters and overcast days, mornings and evenings tend to be best for popper fishing. Good catches of red drum and speckled trout were reported from the recent CCA Red Trout Tournament in the Crisfield area. The large red drum that had provided excellent surface blitzes and catch and release action in the Target Ship area are starting to head south toward the mouth of the bay. There is still a chance to catch late season red drum or cobia over some of the oyster lumps and channel edges. 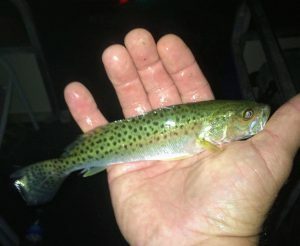 Small speckled trout under 16 inches are showing up in anywhere from Point Lookout to the South and Severn rivers on the western shore. Expect recreational crabbing in all three regions of the bay to be good until mid-October. Cooler water temperatures push the crabs into the rivers and shallower waters in the 10-15 foot range and they will be very actively feeding, with some large heavy male crabs in the mix. Trotlining with fresh chicken necks is the standard technique, but razor clams tend to catch better. Frozen turkey necks will also produce. For the dock crowd, white perch fish heads in collapsible traps or droplines are catching some crabs. For freshwater anglers in western Maryland, the cooler water temps will cause many different species of fish to become active. At Deep Creek Lake, boat and Jet Ski traffic will continue to decline and anglers are able to find quiet fishing spots on the lake and good fishing for a variety of fish. Yellow perch, smallmouth bass and walleye can be found along deep grass edges and caught by drifting live minnows. It is still a bit too early for good pike fishing. 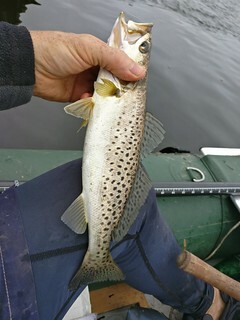 They are starting to get active along weedlines, but we need a good cold front to get those toothy critters biting. Several big largemouth bass are being reported by our readers. As we stated last week, bass are becoming very active for longer periods during the day and can be found near grass and sunken wood. Grass beds are declining, so any existing ones are good places to target. In tidal areas, an outgoing tide is one of the best times to target the outside edges of grass and spatterdock beds. Spinnerbaits, small crankbaits, tubes and various soft plastics are good choices for baits. Fishing for blue catfish is still red-hot below the Route 301 Bridge. Lower salinity values in the lower Potomac have the blue catfish as far south as the mouth of the Wicomico River. Anywhere from that point to the Wilson Bridge provides excellent fishing for blue catfish, with Fort Washington known as a usual hot spot. Blue catfish make excellent table fare and freeze well. In the Ocean City area, keeper sized flounder are still being caught in the area by those casting Gulp baits or drifting live mullet, spot or small menhaden in the back bays and off the piers and bulkheads. The back bay channels are still providing flounder action. As waters cool in mid-October, these channels will be the pathways flounder will use to pass out of the back bay areas and then out the inlet. The ocean wrecks and artificial reefs are producing some good sea bass fishing this week and flounder action has slowed down on those same structures. Trolling the inshore and mid-range lumps and floating weedlines and buoys was resulting in a mixed bag of dolphin, bluefish, king mackerel and Spanish mackerel. Conditions were windy in late September, resulting in big swells and tough fishing conditions. Offshore action for white marlin and Mahi is still good when boats can get out. The white marlin action continues to center in 50 fathoms on the West Wall of the Washington Canyon. A mix of dolphin and white marlin are being reported from the Rockpile and yellowfin tuna are still further to our north off New Jersey and Long Island. The tuna should be moving south through our area as waters cool.